Early on Sunday morning, 8th March 2015, hundreds of people turned out early to witness the touchdown of a record breaking aircraft at Illawarra Regional Airport, to take up its new role as Shellharbour’s first ‘jumbo tourist attraction’. Specially numbered Qantas Flight ‘7474’, this final journey of Qantas’ first Boeing 747-400 took less than 15 minutes, considerably shorter than its record breaking achievement of having flown the longest commercial flight in history on the 17th August 1989, flying non-stop London to Sydney. This time over distance record still stands. “VH-OJA” was Qantas’ first Boeing 747-400 aircraft and was named the City of Canberra. The aircraft was delivered to Qantas on the 11th August 1989 and made its debut flight on the 16th August 1989 from London to Sydney. After touchdown, the aircraft was delivered to its new home with the Historical Aircraft Restoration Society (HARS) where it will become the only B747-400 in the world to be put on public display. The official handover will take place on 15 March 2015 to coincide with HARS monthly open day weekend. After flying nearly 85 million kilometres, equivalent to 110.2 return trips to the moon, the aircraft will join an impressive lineup of famous aircraft located at HARS, which include a Lockheed Super Constellation, Catalina, Douglas DC3 and DC4 and a Desert Storm US Army Cobra. Visitors to the display will be pleased to know that as the delivery flight from Sydney International Airport to Illawarra Regional Airport was the first time a Boeing 747 has landed at this small airport,the Qantas pilots operating the final flight worked with industry stakeholders on a number of approvals and training procedures given the flight was outside normal Qantas operations to a non-Qantas port. In addition, according to a statement by Qantas “A number of considerations were factored in to the preparations including ensuring the appropriate ground handling equipment were positioned at Illawarra Regional Airport for the arrival and giving the aircraft livery a “Permaguard” coating to protect the paintwork for many years to come. 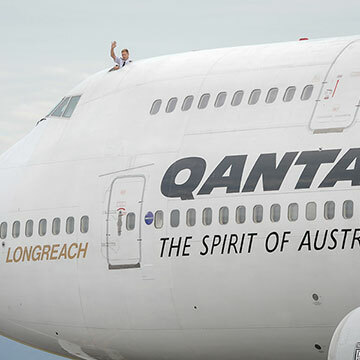 Qantas 747 flies last journey, this time to the desert.